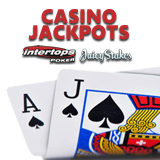 Earn some some extra cash for summertime fun this week at Intertops Poker and Juicy Stakes Poker. Both poker sites are awarding $2000 in special Summer Casino Jackpot prizes June 7th to 13th. Hit any of the designated hands to qualify for blackjack bonuses and video poker bonuses up to $50. Spades Blackjack and Royal Flush pay extra $50. Known primarily for poker, Intertops Poker and Juicy Stakes also offer a wide selection of casino games from Takisto and World Match including several Blackjack games and a selection of video poker games. (Games in Intertops’ main casino do not qualify for this promotion.) Players can win Summer Casino Jackpot bonuses playing standard Blackjack, Double Draw Blackjack or Perfect Pairs Blackjack. There are nine video poker games where they can win jackpot bonuses: Jacks or Better, Aces and Faces, Deuces Wild, All American, Bonus Poker, Double Bonus Poker, Face Up 21, Tens or Better and Double Joker Poker. Bonuses will be automatically credited to your account when designated hands have been hit.